So much for Trump warning of a "big, fat, ugly" bubble. Now that he's in the White House, the new U.S. president is actively cheering on the stock market to go higher -- much higher. 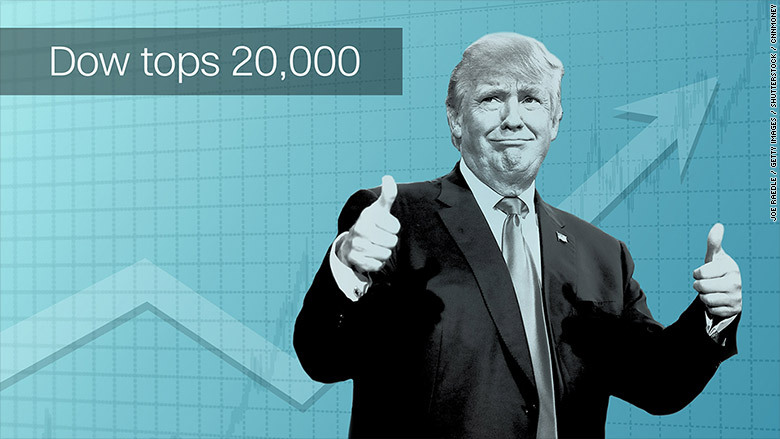 Trump wasted little time taking a victory lap for the Dow soaring above 20,000 for the first time ever during his first full week in office. "We just hit a record, and a number that's never been hit before. So I was very honored by that," Trump told ABC News on Wednesday. The new president correctly pointed out the market has "gone up a lot since I won." 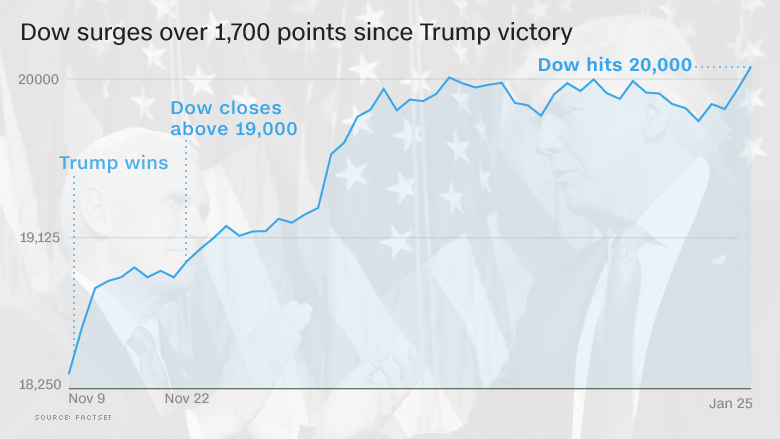 The Dow is up more than 1,700 points since the election, much of it driven by bets that Trump's stimulus plans will make the economy grow faster -- and hopes that his trade agenda won't cause a trade war. "Now we have to go up, up, up. We don't want it to stay there," Trump told ABC. What a difference a few months makes. In late September, Trump warned during a presidential debate that the market is "in a big, fat, ugly bubble." Trump himself hasn't benefited from the rising stock market. He sold all of his stocks in June, according to a spokesperson. Trump told the Today show that he got out because he thought he'd win and it would be a "conflict" to own stocks as president. But is it a good idea for a president to nudge the stock market to go higher? On the one hand, a higher stock market is a reflection of economic optimism and could even encourage Americans with investments in the market to stimulate growth by spending spend more money. Yet just about half of Americans don't have money invested in the stock market, Bankrate and the Federal Reserve have found. "That's fine to be a cheerleader for the economy. But to be a specific cheerleader for the market is best avoided," said David Joy, chief market strategist at Ameriprise Financial. Joy pointed out that some market strategists, including himself, have warned that stock market valuations have become fairly elevated. In other words, stocks may be getting too expensive. "To talk the market higher might encourage some people to abandon their discipline and ignore things like valuations," he said. Stock market records are great, but too much of a good thing can be a bad thing. Recall the stock market booms of the late 1990s and mid-2000s that got out of hand. Millions of Americans lost much of their wealth when those bubbles eventually imploded. "You don't want there to be irrational exuberance. It's a very dangerous thing, as we've come to realize," Joy said. Of course, Trump is hardly the first president to comment on the stock market. Former President Obama is famously credited with helping to call the bottom of the Wall Street meltdown when in March 2009 he said "buying stocks is a potentially good deal if you've got a long-term perspective on it." So will the market keep going higher as Trump has suggested? That will largely hinge on Trump's ability to push through his stimulus plans -- cutting taxes, slashing regulation and unleashing infrastructure spending. And any rally could be short-circuited if Trump's trade agenda sparks a trade war with China, Mexico or another trading partner. But David Kotok, chairman and chief investment officer at Cumberland Advisors, believes investors have become "complacent" because they aren't pricing in those risks. That's why his firm began exiting investments to raise cash in mid-December and continues to do so. "The market is fraught with risk -- unless the Trump agenda is delivered perfectly. History shows that's not easy," said Kotok. 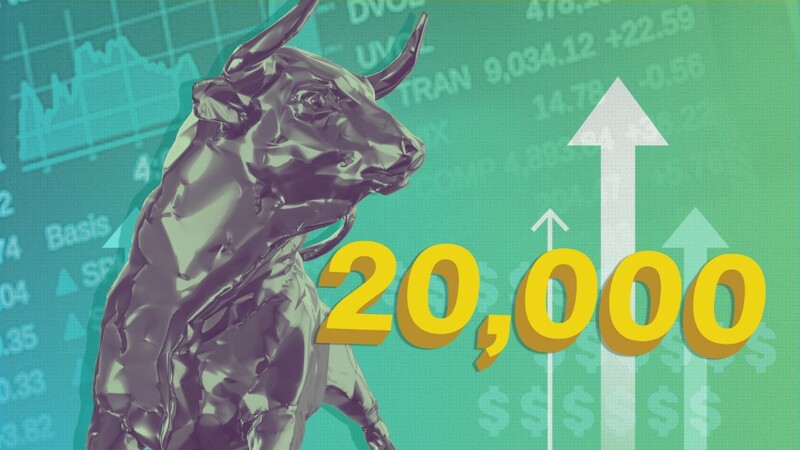 --CNNMoney's Heather Long contributed to this report.